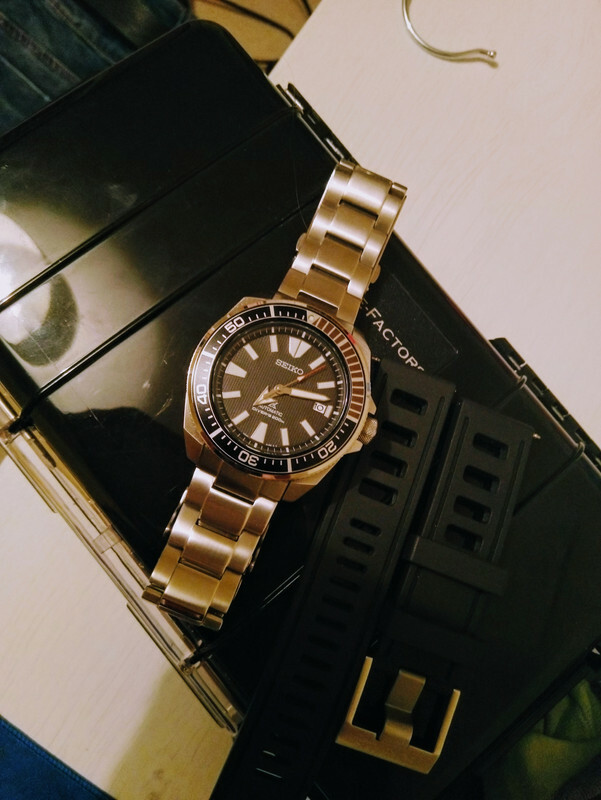 Having spent what is for me, a lot of money on a watch, I thought I’d write a small review of my experience with it so far to provide some reference material for potential owners. 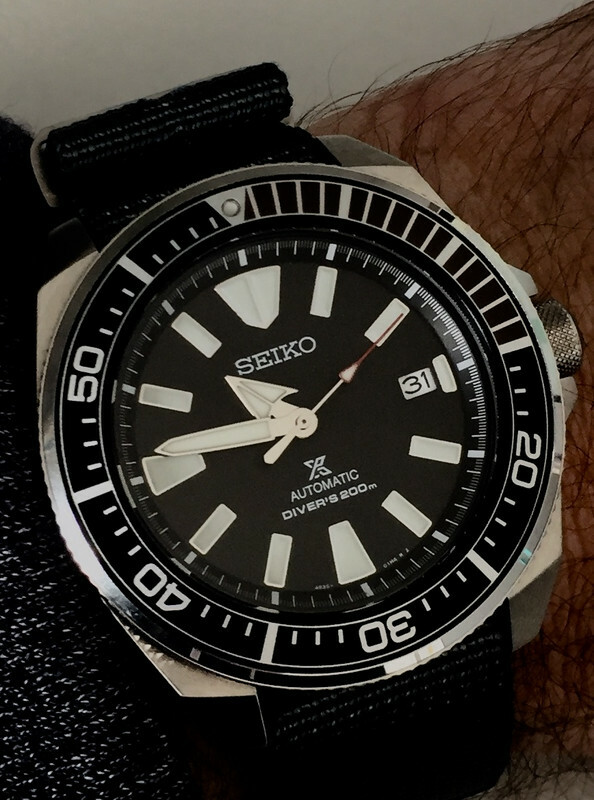 I’m talking about the Seiko SRBP51 Samurai. Dial – waffle pattern is subtle, some days I don’t even notice it. It does give a nice texture to it though. The font is printed cleanly and crisply. Hands – I love them! I particularly like the minute hand as it’s a different shape to I’ve had before. Indices – Love ‘em! Again, different to I’ve had before. They’re applied and lume filled and look fantastic from acute angles. Lume – nuclear. Even on a dull day it glows all night until morning. 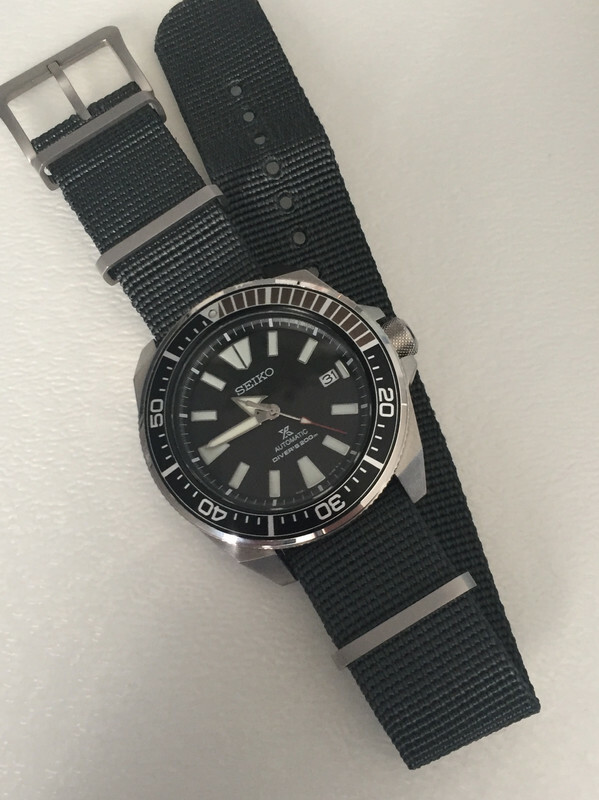 Bezel insert – combination of black, grey and white is a bit different and I like it a lot. 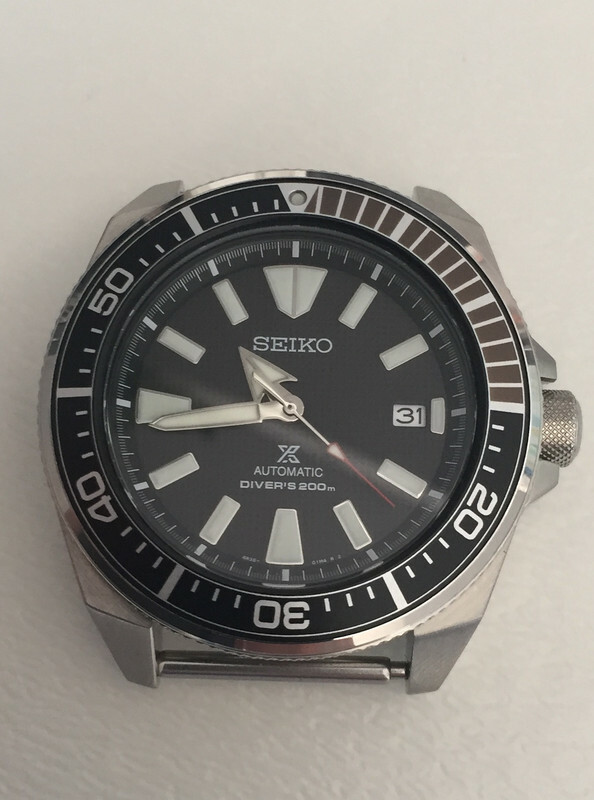 Bezel action – 120 form clicks with very little horizontal play and no vertical play. Outside edge is nobbled to improve grip. 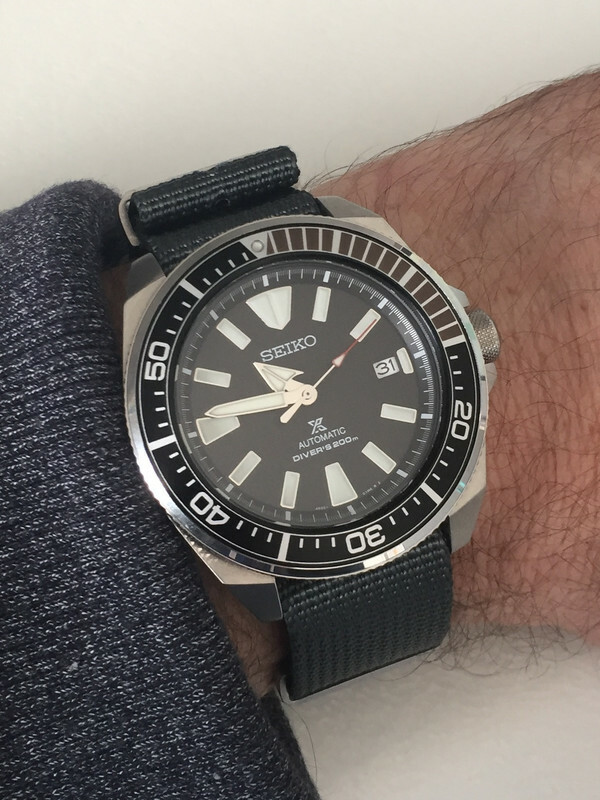 Chapter ring and bezel alignment – perfect! I bought this from an AD so had the chance to thoroughly inspect it before deciding to buy it. 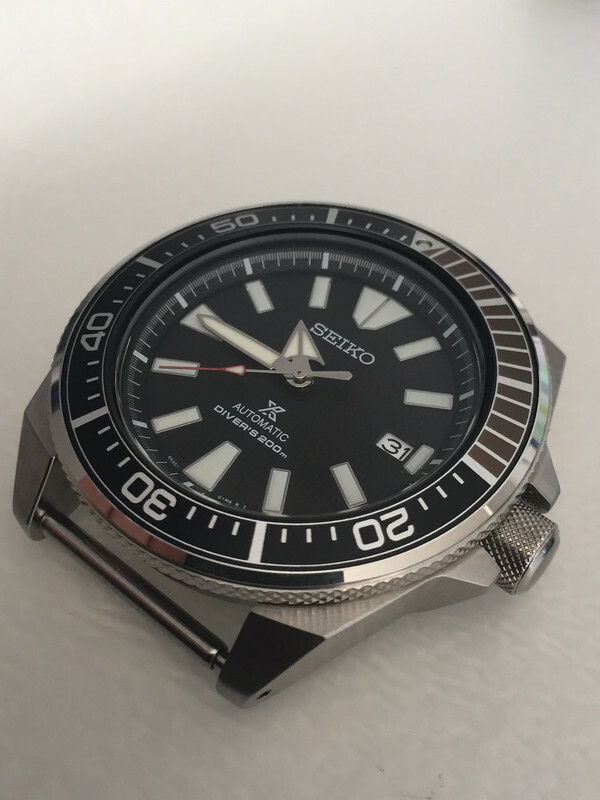 Why can’t Seiko get them all like this? Case shape – turtle-like yet angular but with quite unusual bumpers on the non-crown side. I could live without them but they don’t bother me. The crown guards are excellent, perfect shape and size for me. 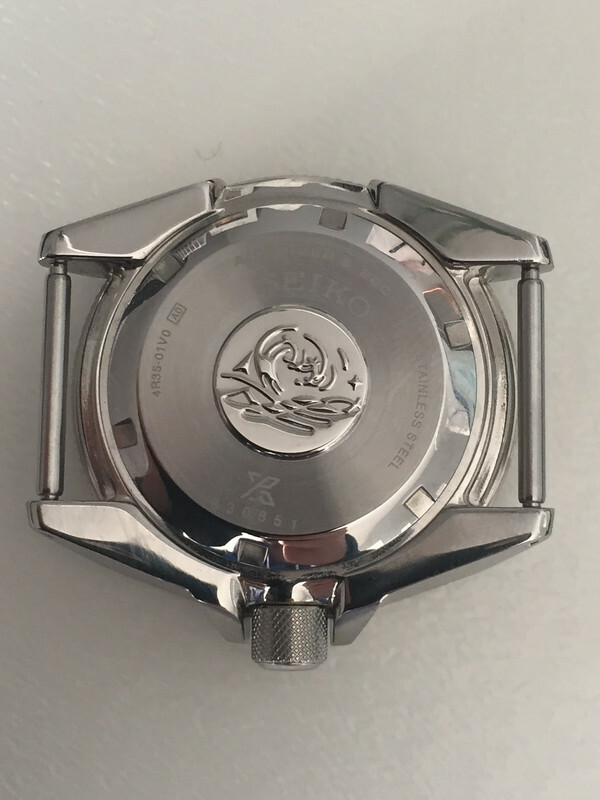 The case also has short lugs which really helps with the overall size on the wrist. Crown shape and action – utilitarian. Nobbly. Quite long. Easy to use with a good winding action and lock position. Timekeeping – excellent. Within five seconds per day. It hacks and hand-winds which is always a bonus of this movement. 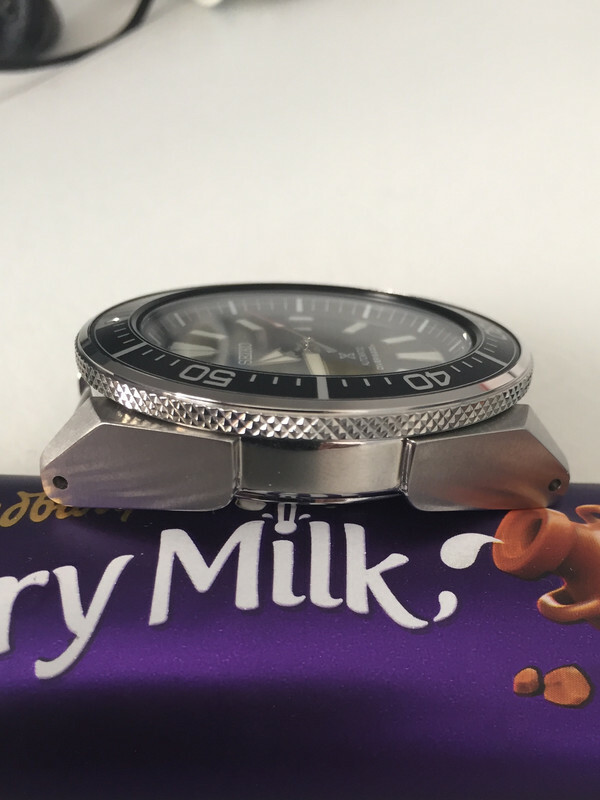 Wearability – bracelet is quality if a little heavy. It’s also more unusual than the stock oyster which is a nice change. For being a larger watch (44mm) it doesn’t wear big at all on my 6.75 inch wrist. What I really love is the way it looks fantastic on a range of rubbers and natos and I’ve included a few pics. 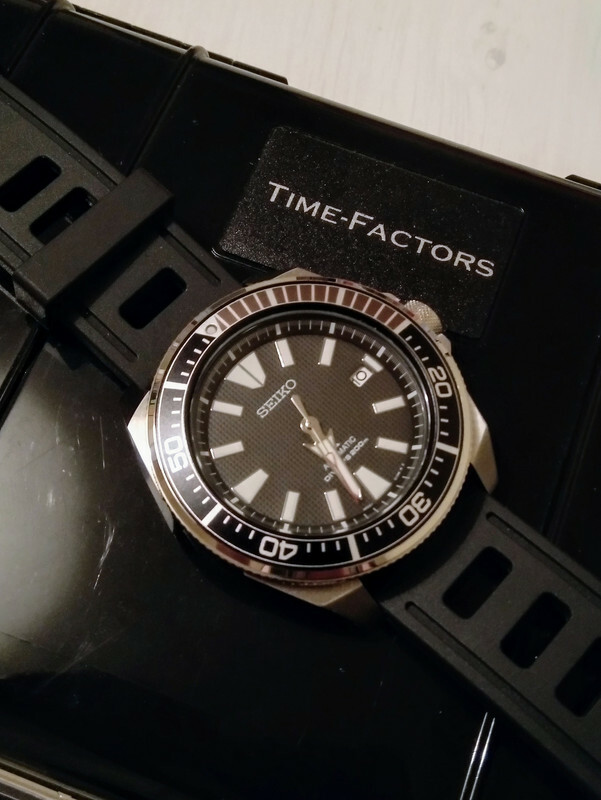 Summary – for a larger dive watch it doesn’t wear big or heavy but it does have the wrist presence that I wanted. 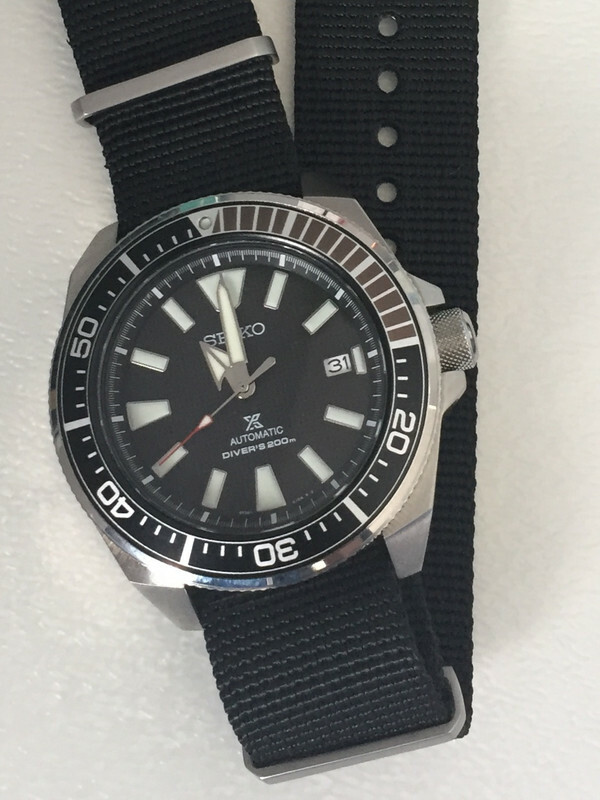 It’s a Seiko diver but with enough diversity to make a nice change from those I’ve owned before. Would I change anything? 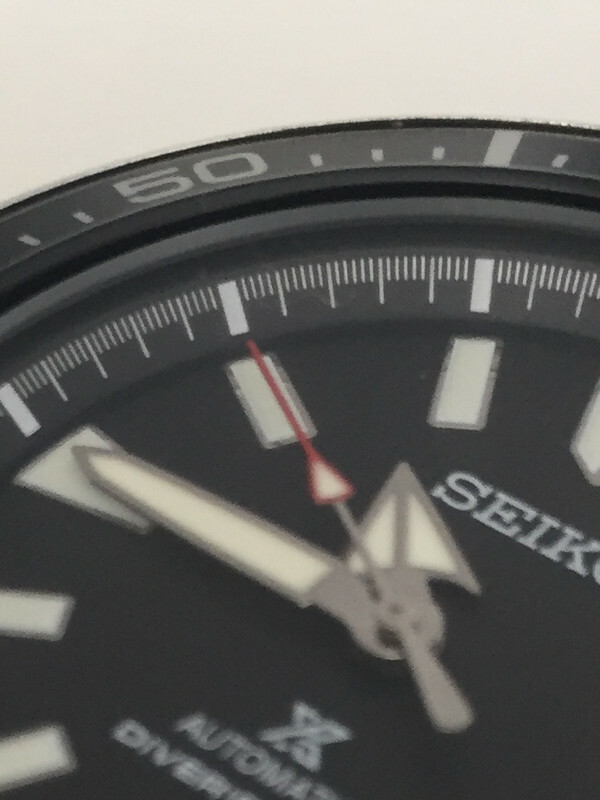 I’d definitely remove the Prospex logo from the dial but it doesn’t bother me enough to spoil my enjoyment. I’d possibly lose the bumpers by smoothing the case but only possibly as it does help create its identity and the more I look at them the more I like them. Last edited by TaketheCannoli; 31st January 2019 at 16:32. Reason: Adding pics. I like it, thanks for the review. I could be tempted by one in the future. Any pics on the bracelet? I don't but when I put it back on I'll take some. I have the 'blue lagoon' version which I picked up on SC a month or so ago, I wasn't sure about it prior to buying as the case size and shape isn't something I'd ordinarily choose, immediately it arrived I fitted a nato strap as bracelets just seem to add unwelcome weight and I've worn it a fair bit since, everything lines up as it should, the bezel action is smooth and precise the lume is the usual Seiko, in fact its a very well executed piece, if I became a 'one watch' person there are far far worse watches to choose. 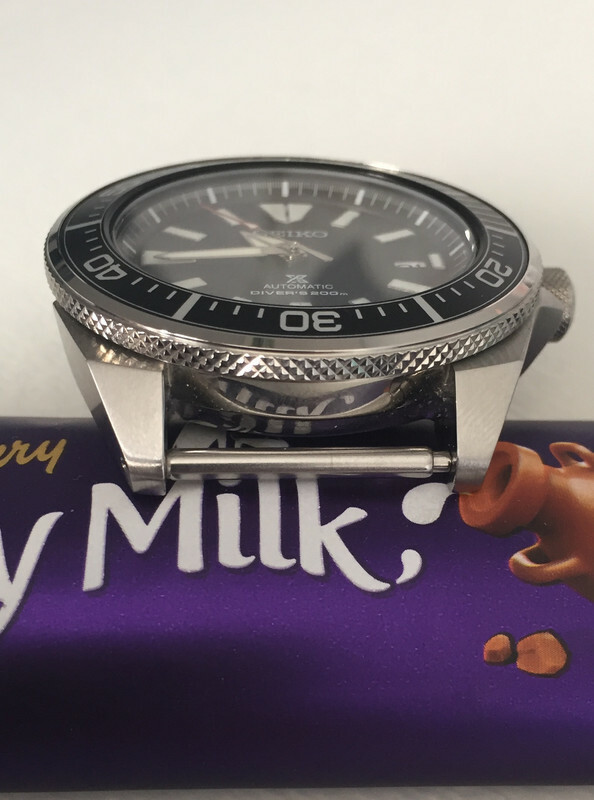 Very nice, and looks to be a perfect size for your wrist. Thanks for the review, I wear mine most days. I’m struggling to find a rubber strap I like. Anyone got any recommendations? I'm going to invest in one soon, but need to flog of some of the divers I already have. 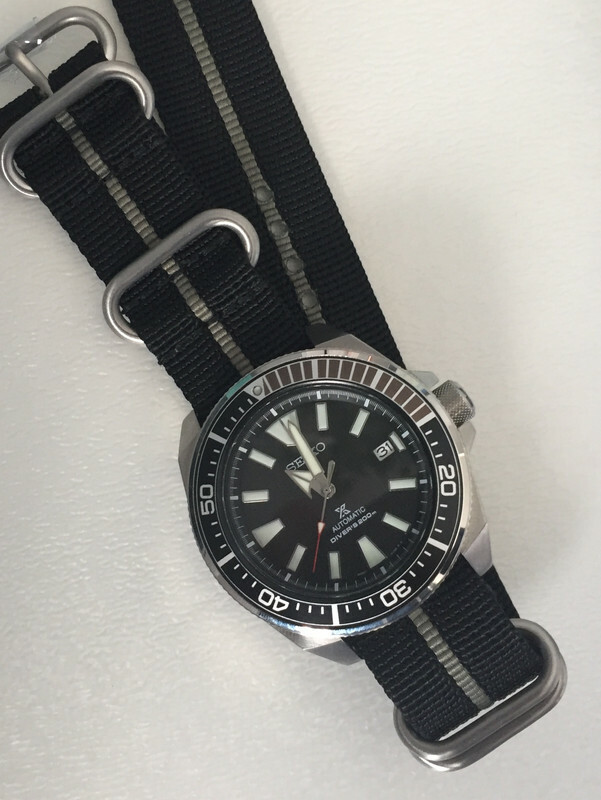 One rubber strap I like is the Hirsch 'Extreme', very comfortable but has an 'aggressive' look about it... it also takes fat springbars. I’m considering the Borealis as the Isofrane simply isn’t worth the extra cost. 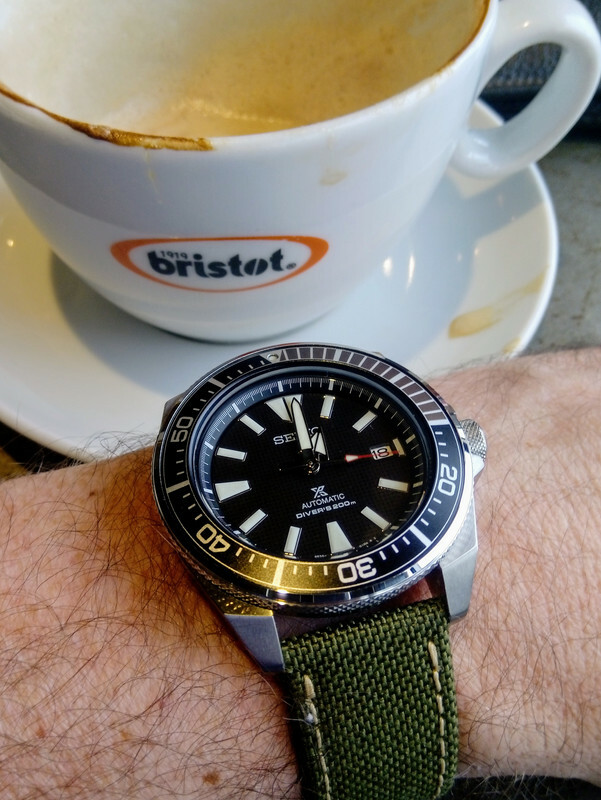 Yeah, I've just put a Borealis on my Seiko Turtle. Very good for the money. 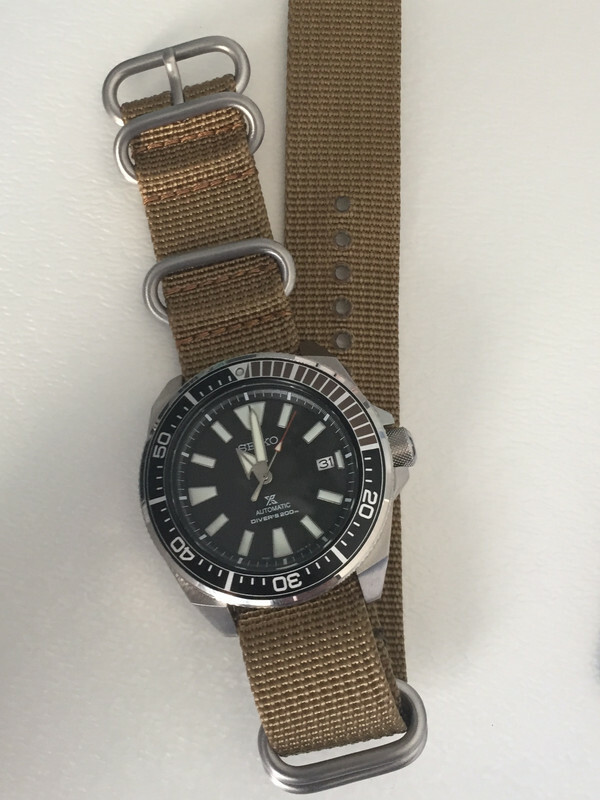 Though I still prefer the isoFranes I've got on other watches but as you say too pricey now. It’s my most worn watch since picking it up on SC around this time last year. The bezel feels tight on mine but it’s never annoyed me enough to figure out if it needs looked at or if they are all like that. 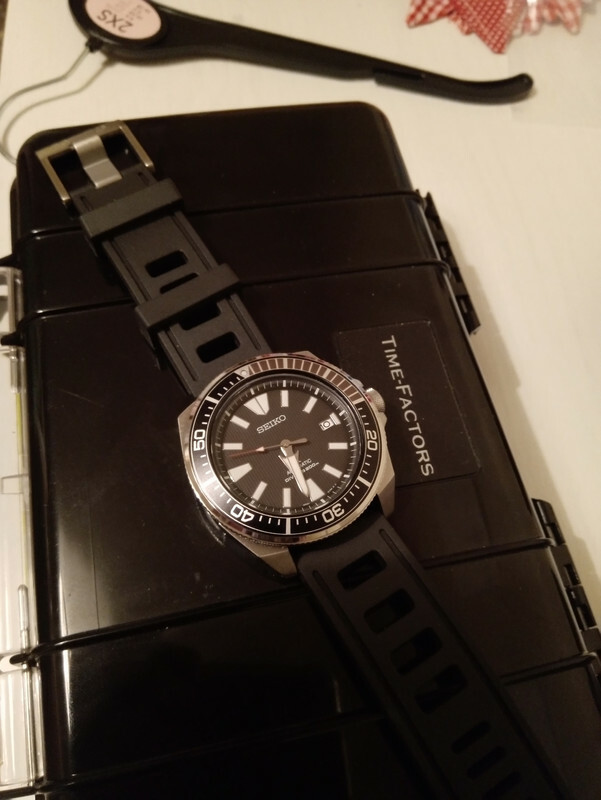 Always liked the case shape and dial on these , i seem to remember Seiko made the samurai a few years back then discontinued them, is this right ? 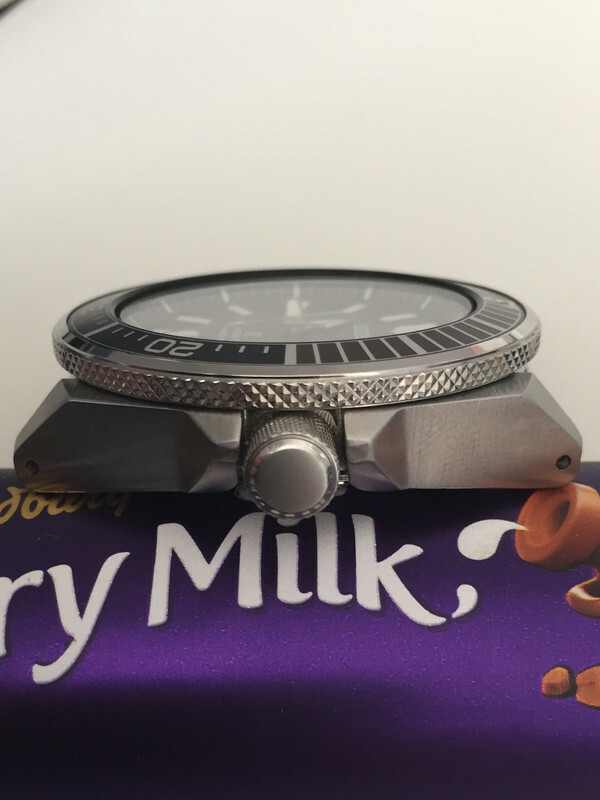 i ask because i don't like the prospex logo and would like one with out (in titanium if poss) good review BTW. You’re right about the previous model but I don’t know if it came in Ti. I can honestly say the lume on this is the best I’ve experienced in all my years of watch ownership. With regular daily wear it’s still glowing like a torch when the alarm goes off at 6am. I can read it clearly through the night and….I can see it glowing through the quilt! I went for the Borealis and feel it was the right decision. Only problem is that I now want the green, blue and orange ones! Also a shot on the bracelet as requested. Nice review thanks. I went between Samurai's and Turtle's for a while and bought a Turtle but I think I will try one of these in the future too. Hmm, mine’s adequate but that’s it. Glows like a torch for 5 minutes after direct sunlight exposure, within another 5 mins it’s faded. Oh well, I got the ‘everything lines up but knackered lume’ model!! Are bezel swaps easy with these, I quite fancy fitting the bezel with the orange quarter. Haha, you must have. I don’t understand why they’re not all the same lume. I went to bed at 11:30 last night and it was still glowing and readable at 6:40 this morning. [QUOTE=RobDad;5021400]Hmm, mine’s adequate but that’s it. Glows like a torch for 5 minutes after direct sunlight exposure, within another 5 mins it’s faded. Oh well, I got the ‘everything lines up but knackered lume’ model!! Thanks for the review, would love to see more of these in the forum! 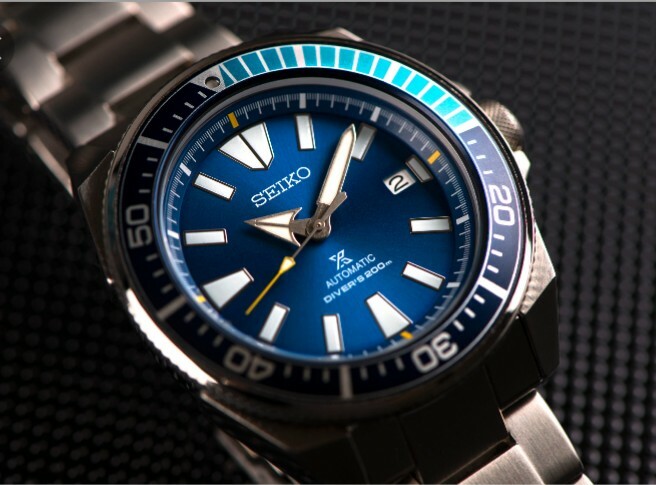 Brilliant watches, since buying mine I've sold my other blue divers watch.